This is The Digital Story Podcast #568, Jan. 24, 2017. Today's theme is "Why Churchill's Portrait was Burned." I'm Derrick Story. When a subject allows us to photograph them, they are putting their hearts in our hands. And the decisions that we, the photographer, make in those moments together bear great weight on the final outcome. Is our goal to solely please the subject? Do we have a responsibility to integrate our own artistic vision into the work? Or should we ignore the desires of others and portray what we believe to be honest? I grapple with these questions in today's show. For Winston Churchill's 80th birthday, House of Commons and House of Lords commissioned a formal portrait by modern painter Graham Sutherland. The painting showed Churchill seated in a chair with his hands resting on its arms with him slightly slumped and portrayed in dark wintery tones. Churchill hated the painting. Sutherland argued that he had painted what he honestly saw. During its public unveiling, Churchill quipped that it was, "a remarkable example of modern art." The painting was never hung in public. And as the story goes, it was hidden away in the cellar of their Chartwell estate... until in the middle of one unparticular night, it was smuggled out and burned. Years later, when Sutherland learned of the destruction of his work, he is claimed to have said, "without question an act of vandalism." So who was right? Winston Churchill, who had tried to guide the artist toward a more flattering portrayal, but upon failing to do so, chose to destroy the work? Or Graham Sutherland, who despite pressure from his subject, stuck to his beliefs that his responsibility was to show the famous statesman as he truly looked in his 80th year? I think the question comes down to what is honesty, and does it only exist on the exterior? Or should we as artists consider the human being beneath the surface when making our choices on how to portray them? Fujifilm X100F steps up to 24.3MP, adds AF joystick. Fujifilm is taking the wraps off the X100F, the fourth generation of its popular enthusiast-focused compact series. It updates the house that the X100 built with a 24.3MP X-Trans III APS-C sensor and X-Processor Pro image processor borrowed from the X-T2. Changes can also be seen on the top and rear panels of the camera - notably, an AF joystick makes its first appearance on the X100 series. Other controls have been shifted to the right of the LCD, and up top the shutter speed dial has been modified to include ISO controls. A front control dial has also been added. The hybrid viewfinder has also been updated, and now offers image magnification when using the electronic rangefinder mode. The Fujifilm X100F will be available February 16th in black or silver for $1299/£1249. (As reported by DPReview.com). The issue of businesses asking photographers to work for free has been a hot issue in recent years, and now we have some citable statistics that shed more light on it. According to a new study in the UK, 87% of photographers were asked to work for free in 2016, and 16% said yes. The research was conducted by the UK startup Approve.io, which surveyed 1,009 part-time and full-time freelancers in the UK who have taken on freelance contracts over the past 5 years. The study "reveals an alarming trend for corporate 'entitlement' when it comes to how freelance professionals are treated," Approve.io tells PetaPixel. You can read the entire story on Petapixel. The registration forms for the The Chicago to New Orleans Rail Adventure - June 26-29, 2017 - have been sent out to members of our reserve list. This workshop begins the day after Out of Chicago concludes. So if you're going to OOC, just add Sunday night to your hotel reservation if you plan on joining us. You can still get on the reserve list for this event, and for our others, by visiting the TDS Workshops Page and using the Send Me Info form on that page. The long overdue storm season in California is producing dramatic landscapes once again. 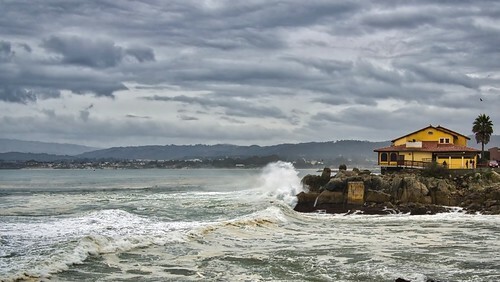 I made a stop in Monterey yesterday for a bite to eat and to capture some of the action with my Olympus OM-D E-M5 Mark II. Originally I opted for video to record the tumultuous sea. But then I wanted a few stills too. So I switched to RAW mode and worked with the Panasonic Lumix G II 20mm, F1.7 lens. I kept the shutter speed at a conservative 1/60th of a second to capture a little motion with the crashing waves. You might think at this point that I would open the RAW in Lightroom or Capture One Pro. But I'm on vacation and wanted to play. 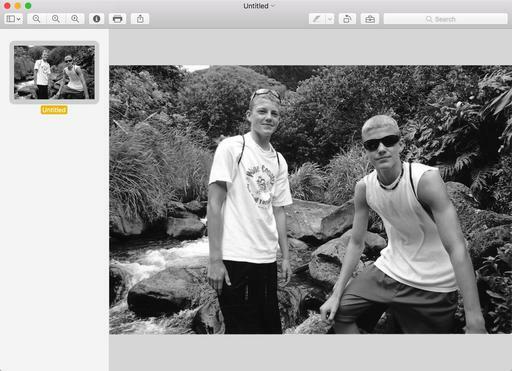 So the images went into Photos for macOS. Then I used the Luminar editing extension to pull the drama that I knew lurked in that RAW file. And Luminar did just that. Want to see the difference? 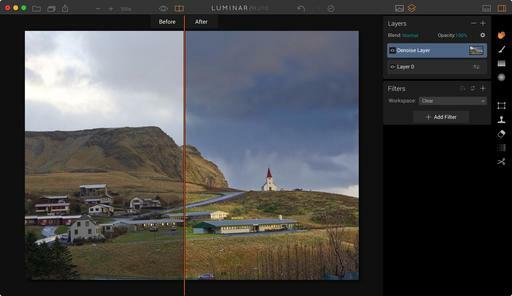 Take a look at this before/after view in the Luminar editing extension. If I were to switch right now, a serious contender would be the Fujifilm X-T20 mirrorless camera. I'll start by listing its impressive specs (including the $899 price tag), then I'll get to the real temptation. Clearly, this is a camera that can get the job done. But what pushes me over the edge is both the X-T20's button and dial layout, combined with its artistic film simulation modes. I think Fuji's top deck is one of the best in the business. And for those of us who like a very tactile experience while shooting, these cameras are a delight. Then there are the film simulation modes and grain control. Another thing that Fuji knows (very, very well) is film. And their evolution into digital imaging has retained the knowledge they gained during the analog years. The Fujifilm X-T20... "also has a Grain Effect function for reproducing distinctive graininess seen in photographs taken with film cameras. 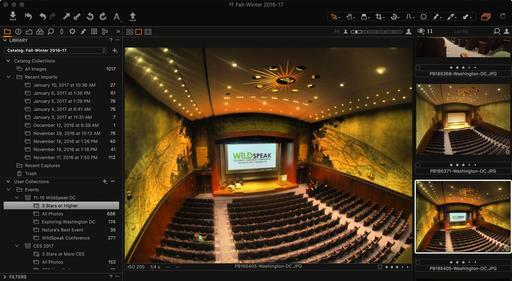 The function can be set to Strong or Weak, and can be combined with any of the Film Simulation modes. You can easily obtain the look of film-based photos, with the effect most obvious when the image is printed out." Combine this with the new ACROS Film Simulation mode (added to the already excellent simulated film emulsions), and I could truly extend my analog endeavors, even when it wasn't practical to shoot film. Like I said, this is one tempting camera. The Fujifilm X-T20. has a high Nimbleosity Rating. What does that mean? You can learn about Nimbleosity and more by visiting TheNimblePhotographer.com. I love the RAW editing tools in Capture One Pro. But there are times when I want to tap the magic of Luminar and its extensive set of filters. And I don't want to compromise my digital asset management system to do so. As a result, I needed to figure out how to get these two kids to play together. And that's what I'm going to show you right now. Image edited in Luminar, then returned to Capture One Pro for asset management. Photos by Derrick Story. Since you're not going to get a clean roundtrip from Capture One to Luminar then back, the next best thing is to use the Open With... command in Capture One (right-click on the image and choose Open With... from the popup menu). 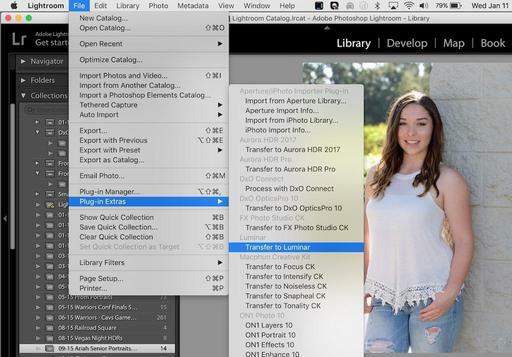 Luminar can process your RAW files, so you're sending over a high quality image for editing. Select Luminar from the popup menu, and the image will open in the app. Edit as you normally would in Luminar, using the filters and presets to achieve the look you want. Once the image is ready to send back to Capture One, choose the Export command in Luminar, File > Export. This is the point where you have to think about your file organization. My recommendation is to set up a standard receiving folder for the Luminar images, then import from that folder back into Capture One. Mine is a referenced system, leaving the images where they are and pointing the Capture One database to them. I tend to send back full sized Jpegs to keep file size reasonable. But you can choose Tiffs or another format, if you wish, during the export process. The before and after for this image in Luminar. I add the word Luminar to the file name when exporting it, so I will know a bit about the picture's history when reviewing it in the Capture One catalog. 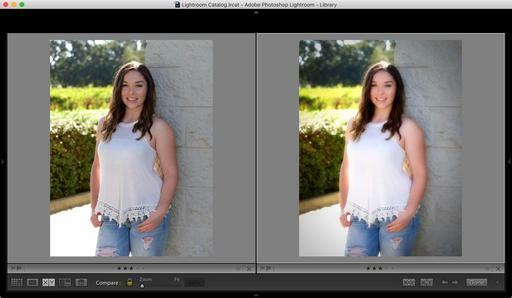 Since the file name for the edited image is the same as the original, except for having Luminar at the end, the picture shows up in the catalog next to the original. 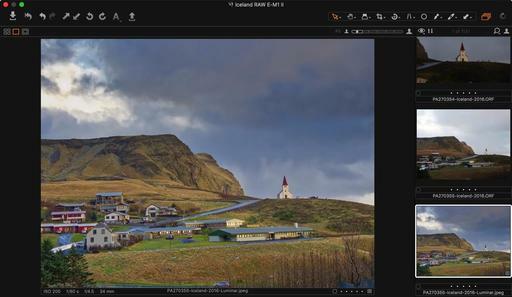 Luminar image back in Capture One Pro for asset management. All my IPTC and EXIF metadata is intact, and I now have another powerful option for working on my images stored in Capture One. If I do a lot of work to the shot in Luminar, multiple layers for example, I may also want to save the image as a separate Luminar file so I can go back and pick up my work at a later time. I can always export the updated version into Capture One Pro for management with the others. Haven't tried Luminar? You can download a free trial here. That innocent looking Preview app on your Dock can handle so many photography tasks that we sometimes forget all the things that it can do... such as digitize a snapshot in 3 easy steps. Just make sure your Mac and Multi-Functional Printer are on the same network. Put the snapshot on the glass scanning surface, then fire up Preview. Step 1 - File > Import from Scanner. 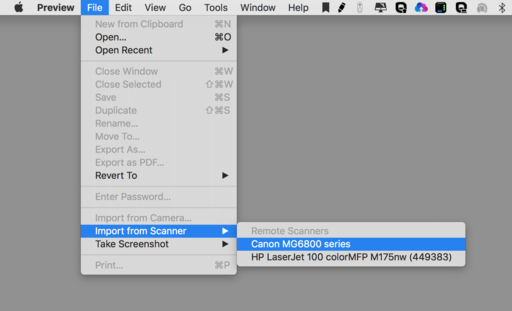 Go to File > Import from Scanner. You should see your device online. Select it. Step 2 - Choose your settings. The scanner should begin to generate a preview for you. If you don't like what you see, such as wanting to make an adjustment or repositioning the snapshot on the glass, do so, then click the Overview button to generate another preview. Now you can choose your settings such as B&W or Color, DPI (I like 600), Auto Selection (easy way to scan just the image and not the entire surface), Format (Jpeg is the most common), and any image correction necessary. Once you've set those, click on the Scan button (see figure 2). Step 3 - Save the image. Photography is both my hobby and a substantial revenue stream. I once kept both worlds in the same application (Aperture), but over the last couple years, I've separated my personal work from what I shoot for hire. Technology has had much to do with this. In 2012, for example, I shot just about everything with the same camera. iPhones weren't as good, Cloud sharing not as robust, and my workflow was essentially to remove the card from the camera, insert it into my Mac, and load everything into Aperture. But 2017 is much different. I love shooting my day to day life with the iPhone, Olympus TG-4, and a variety of 35mm film cameras. The digital images flow right into my Photos for iOS and macOS apps, and they're instantly available to share, print, and post. It's easy and enjoyable. I've never been happier as a hobbyist. My professional jobs involve higher resolution cameras, bigger files, larger quantities for each session, multiple export options, and serving as an archive for my clients. And for this work, Capture One Pro 10 has become my go-to app. Here are five reasons why. The tools for catalog management include projects, albums, groups (the equivalent of folders in Aperture), and everything else that I need to slice and dice a shoot. Plus, I can also manage content on my hard drives right there in the Capture One interface. When I load thousands of images into a catalog, I want to be able to tame them as quickly as possible. 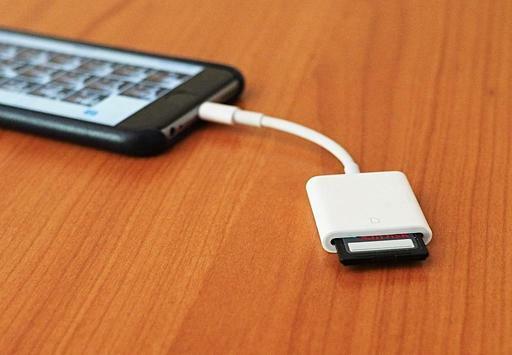 Capture One makes that easy. The Capture One look is different than any other processor that I've used. It's bold. My RAW files jump off the screen even before I begin editing them. Ninety-five percent of the time, I can handle all of my image editing in Capture One Pro. Starting with the amazing Contrast slider (that is far more than you'd think), to sophisticated color tools, to lens corrections, to localized editing brushes... this app provides what I need to get the most out of my images. The Output tab screams professional app. Here I can create a variety of custom export options to run individually or all at once. So if I need a set of master images to send to the client, and another set of web shots for an online gallery, Capture One Pro can provide that for me all at once. I can run a managed catalog or choose to go referenced with external hard drives storing my masters... on both Mac and PC platforms. I can enable a Session while on the road or working on a specific assignment, then incorporate that content into my master catalog. And I can do just about anything else I want with the Capture One Pro catalog structure. Perfect for guys like me who travel and have a master setup back at the studio. I'm entering my second complete year with Capture One Pro. And I have to say... it feels great to have made a complete transition from Aperture. If you'd like to spice up your Lightroom post production, consider tapping the Luminar plug-in that's included with the app bundle. 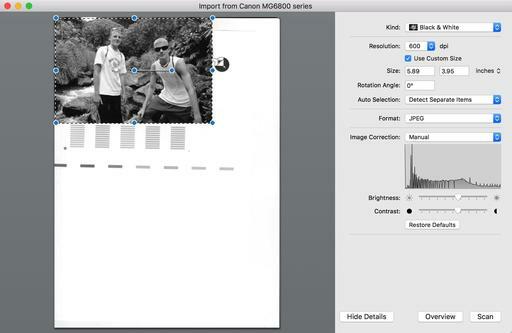 It's easy to use, and provides a whole new set of editing options for your Lightroom images. 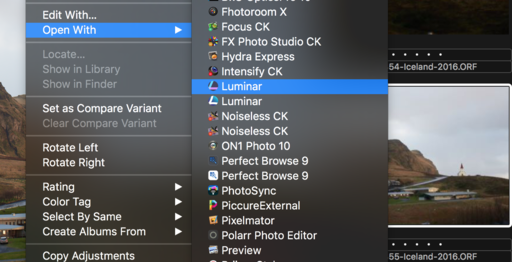 First launch the Luminar app, the go to Luminar > Install Plugins. If the Lightroom plugin is already installed, you're golden. Just click Done. If not, click on the Install button, then click Done once the install is completed. You can now minimize Luminar. If you just installed the plugin, you'll have to restart Lightroom. Now everything is ready for the next step. In Lightroom, click once on a photo you wish to edit, then go to File > Plug-In Extras > Transfer to Luminar. 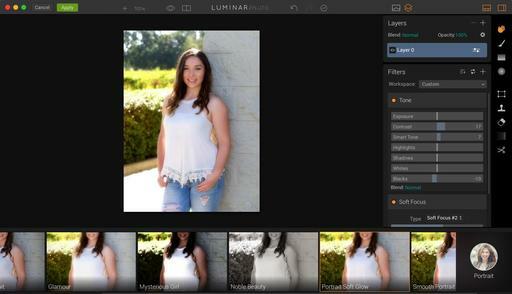 After a few seconds, the image will appear in the Luminar interface where you can use all of its creative tools. Once you've finished your work in Luminar, click on the Apply button, and your image will be flattened and returned to your Lightroom catalog as a Tiff. Mine always come back right next to the original image. I've found that the Luminar toolset helps me explore my photographs in a new way. As such, it's a great complement to Lightroom's adjustments. If you decide that you want to work more in depth with Luminar, creating multiple layers and enabling localized adjustments, I recommend that you open a master version of the image in the standalone Luminar app. By doing so, you can save your work document, with all of the layers and adjustments, and come back to it at a later time. But if you're looking to quickly add come creative punch to a Lightroom catalog image, the plugin is both convenient and fast. You can try Luminar for free. And if you like what you see, the entire package is only $69. This is The Digital Story Podcast #566, Jan. 10, 2017. Today's theme is "10 Questions I Asked Myself in Las Vegas." I'm Derrick Story. If you've read my latest Nimble Photographer Journal entry, you know that I was a bit underwhelmed with CES this year. And I found myself muttering these questions as I roamed the hallways of Mandalay Bay and the Las Vegas Convention Center. So I thought you might find them interesting. This year's show was more renovation than innovation, IMHO. I mean, I like kitchen remodels as well as the next guy. But I don't usually travel to Las Vegas to experience them firsthand. Here are a few questions, with answers, that passed through my mind during the week. Why doesn't my monorail pass work? - Great high tech idea: My prepaid monorail pass will be combined with my CES pass so that I'll have one easy to use badge for everything. Problem is, not only didn't my monorail pass work, I may or may not see a refund for my prepayment. Where the heck is Olympus? - After not hearing a peep from them before the show, I wrote my contact and asked. Olympus decided to sit this out. They must of knew something that I didn't before the show. Is Lyft as Good as Uber? - Since I didn't have a functional monorail pass, I decided to take advantage of the $5 per ride credit that Lyft was offering. I hadn't used them before, and was curious about their service. Bottom line: they are every bit as good as Uber. What happened to the Canon booth? - One place that I could always count on for lots to do at CES was the Canon booth. This year I felt like they were jobbed out to a 3rd party vendor. When did AT&T fix its network? - About half way through the show, it dawned on me that my phone had been working the entire time. This is quite a feat in a venue with thousands of connected geeks. Is it worth switching to Fuji just for the Titanium XT-2? - As if this camera didn't look hot enough already!. Are we seeing comebacks from Polaroid and Kodak? - Unlike some of the other Polaroid cameras of late, the Pop looks like a quality device. And Kodak is finding a voice again with a second generation Super 8 and the revival of Ektachrome. Is there no limit to what people will endure for a free lunch? - I can't believe what the press corps tolerates just for a dry sandwich. 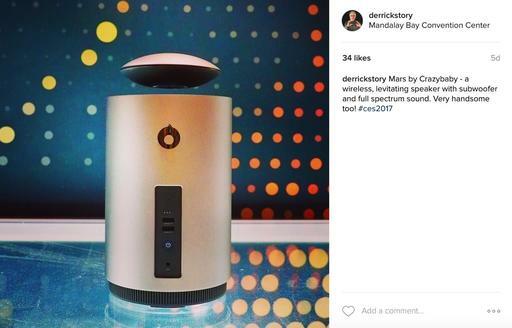 Is it possible to attend CES and not come home with a cold? - Apparently not! DJI reportedly takes majority stake in Hasselblad. "DJI is reported to have acquired a majority share in Hasselblad, according to an article posted January 4 on Luminous Landscape. We asked DJI's Corporate Communication Director of North America, Adam Lisberg, about the reports and he declined to comment. It's telling, however, that DJI isn't making an effort to deny the reports." "The initial report from LL, written by Kevin Raber, recounts the history of Hasselblad from the company's aerial beginnings to the announcement of the X1D system. Raber speculates that unexpectedly high demand for the X1D forced Hasselblad to look for funding to produce the camera." If you follow me on Instagram, Twitter, or Facebook, you may have noticed that I was relying heavily on my newish Rokinon 7.5mm f/3.5 Fisheye Lens during this trip. 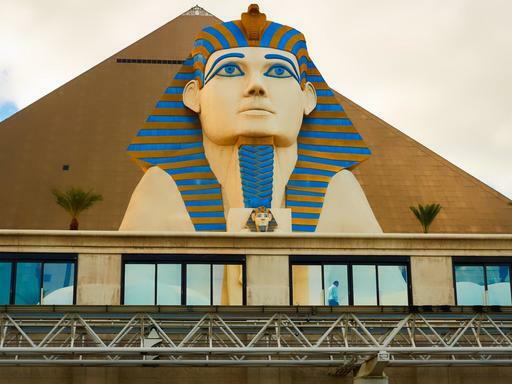 The bigness of Las Vegas seemed like a natural subject for this optic. And I have to tell you, I loved shooting with it last week. More about my adventures with it in this segment of the show. 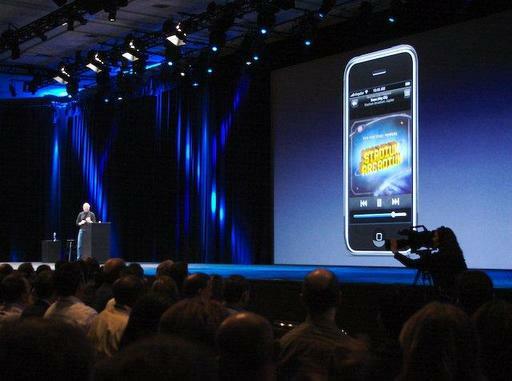 I remember Macworld 2007 quite well. Thanks to my being on the conference faculty, I had a decent seat for the Steve Jobs keynote... the one where he introduced the iPhone. The Introduction of the iPhone, San Francisco 2007 - Canon Rebel XT, f/4, 1/20, ISO1600, -1.0ev, 28mm. Photos by Derrick Story. By 2007, we really needed an all-in-one device that could handle phone calls, text, personal organization, and the Internet. We were tired of juggling Palm Pilots and candy bar cell phones. Blackberries seemed too pedestrian. And if we could get a decent camera out of the deal, all the better. The problem was, that first 2-megapixel iPhone camera wasn't very good. And it certainly wasn't going to challenge the Canon XT I toted to San Francisco in 2007. 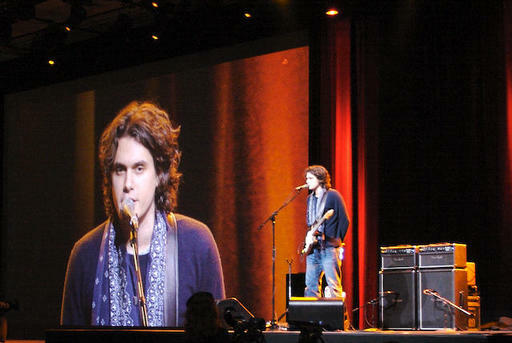 John Mayer performing at the 2007 Macworld Keynote. Canon Rebel XT. But the iPhone's sophistication evolved steadily, and by the iPhone 4, we had a good camera in addition to its other mobile features, and things began to change in the world of photography. We know that the iPhone has all but killed the consumer compact digital camera. I never really liked carrying them around anyway, to be honest. I have two front pockets in my jeans: one for my wallet and the other for my iPhone. That's all I want with me. Beyond that, however the iPhone was more than just my new compact camera, it was an integral link in my overall photography workflow. Regardless of what camera I was shooting with, I could upload those images, edit them, and publish from practically any location in the world. During my reporting in Las Vegas last week, I would capture the image with an Olympus OM-D E-M5 Mark II, send the images to my iPhone 6S via WiFi, and share them on Instagram, Facebook, and Twitter from hotel lobbies, Starbucks, and yes, the occasional casino lounge. As much as I like the iPhone camera, and I do like it, what I truly appreciate these days is the mobile connection to my entire photography ecosystem that includes iCloud, Photos for macOS, and all of my social sites. The iPhone is my Swiss Army Knife for reporting on the road. And as such, it has helped me become a more timely, creative photographer. And to be honest... I'm having more fun than ever. Just when I was beginning to think that connected devices were going to overrun the halls of the Las Vegas Convention Center, Panasonic and Canon take the spotlight and show photographers that there's plenty for them at CES too. The Canon GX9 Mark II. I held the latest version of the GX9 last night at the Pepcom Digital Experience "Technology Tailgate" Event, and was amazed at how light and nimble it is. The big news about this 1"-sensor wonder is that Canon added its DIGIC 7 processor that allows for 8 fps when shooting RAWs. Basically, it's a muscle car squeezed into a compact. 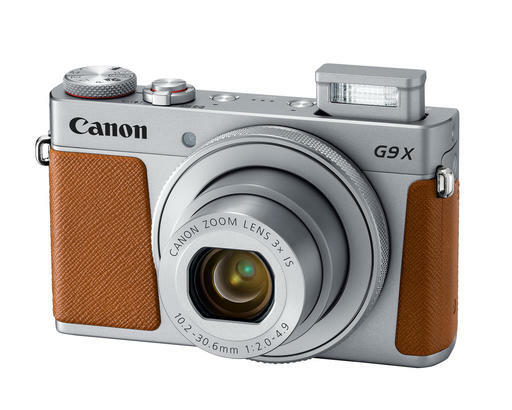 You can preorder the GX9 Mark II for $529 (in silver or black). It should be available next month. Panasonic's flagship mirrorless camera definitely has a Hemi under the hood. Take a look at this list of highlighted specs. Where Panasonic is distinguishing itself from the Olympus OM-D E-M1 Mark II is with video performance. In addition to its still photography prowess, the GH5 is a serious movie making machine, from cinematic theater to corporate training. 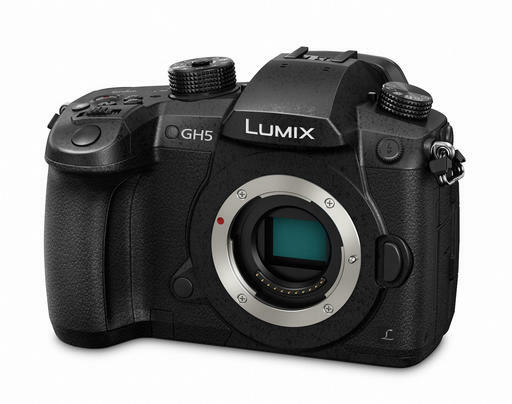 If there was ever any doubt that Micro Four Thirds rules the roost for mirrorless lens catalog, these latest updates from Panasonic should confirm what many of us already knew. Case in point are four refreshed pro lenses, adding a new exterior finish and Dual IS performance when mounted to compatible cameras. They also include a micro step drive system that makes them even better suited for smooth focusing when recording video. The refreshed lenses include: 12-35mm f/2.8 II, 35-100mm f/2.8 II, 45-200mm f/4-5.6 II, 100-300mm f/4-5,6II. Panasonic also introduced the Leica DG Vario-Elmarit 12-60mm f/2.8-4.0 ASPH. Power O.I.S. ($997) for pros who want a versatile zoom for just about any situation. Other camera makers are making a splash at CES too. We'll keep the coverage coming. Stay tuned for more news. Join me on my Instagram site as I explore the world of photography in Las Vegas.